Knitting IMHO is a form of weaving, so I fit right into Teotitlan del Valle where weaving is the culture. Fiber and textile artists tend to experiment with different forms of the art. But first, a bit about the wool. This is 100% super wash merino roving with a 23u top that I bought from DTK Knits in Apex, North Carolina. I love the variegation of color that they achieved and the softness of the wool. They hand-painted it and put it out in the sun to dry. Sun-dried, solar dyed! The 4 ounces I bought cost $18.00 USD. I brought several of these types of skeins with me to use for felting projects over the next few months, although I will be dyeing wool roving here, too. As I showed Federico and Dolores my stash yesterday, they ahhed and oohed, and we talked about what it might be like to spin the roving. I could then knit a hat for Omar and then one for Eric. Federico grabbed a bamboo bobbin and attached it to the spinning wheel. We then separated the roving into strands thin enough to spin, but thick enough so it wouldn’t fall apart. That took both of us. Then we were ready to go. After the bobbin was full, I put it into a sealed plastic bag with one end open to pull the tail of the thread through. That way, the bobbin stays intact. Next, I made a sample swatch to figure out the gauge or how many stitches to cast on to fit Omar’s head. Since he wasn’t there, I measured Federico. This wool knit up at about 3 stitches per inch and Federico’s head measures 23″ so I cast on 74 stitches using a #10-1/2 (or 6-1/2mm) needle. 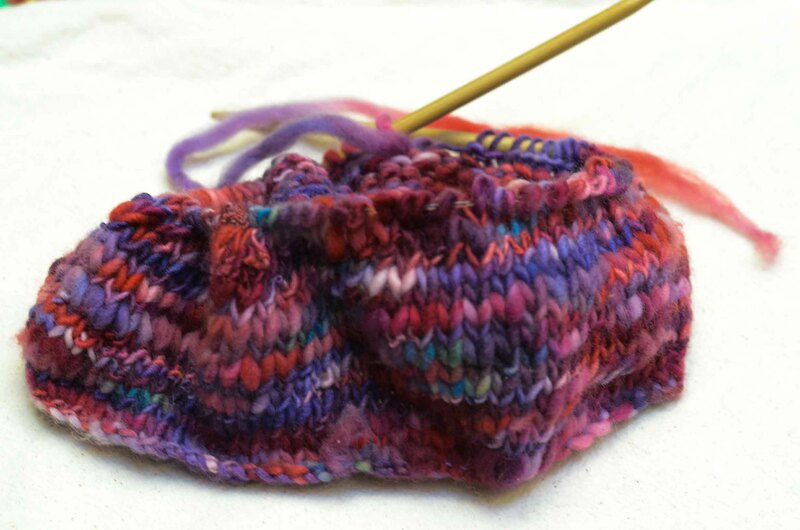 I knit two inches of length and then decreased four stitches in order for the rim to turn up and show the purl side. Then, I will continue knitting until I have about 7″ of hat. Then, using double pointed needles, I’ll begin to decrease every two stitches until there are four stitches left. Take a crochet hook and pull the yarn through the four stitches and tie off. Bring the yarn through to the underside and weave it in. 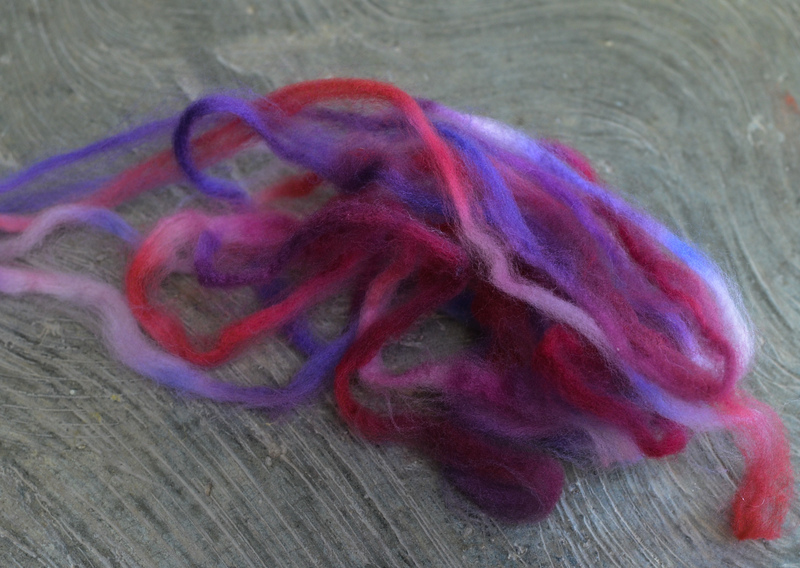 I buy ecru merino roving to dye from Paradise Fibers. 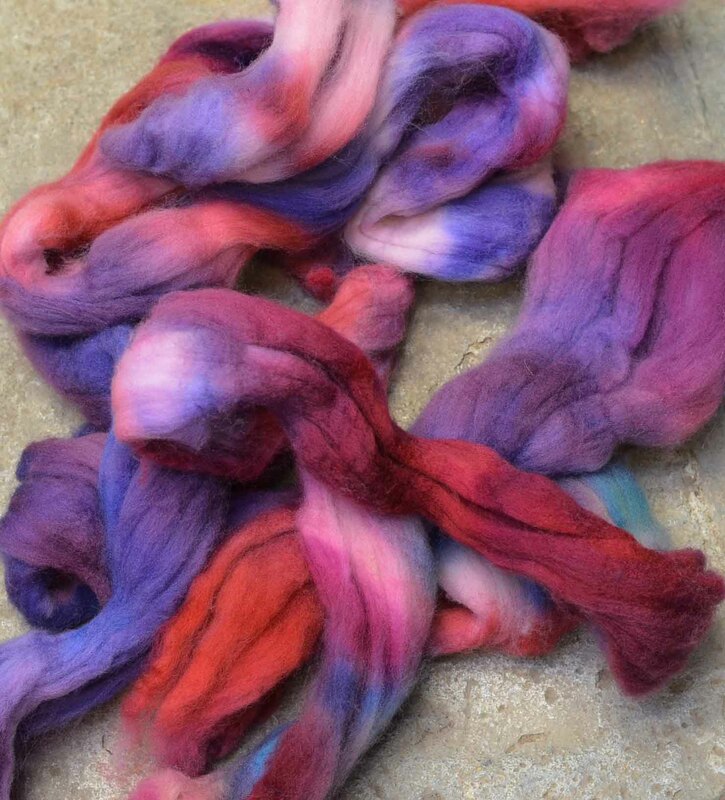 I order dyed roving online from various Etsy resources like Rachel Jones’ On the Round, who spins and dyes near Portland, Maine. I met Rachel last summer at a street fair and loved her wool. And, here’s the start of the hat! Didn’t it knit up beautifully? And, P.S. 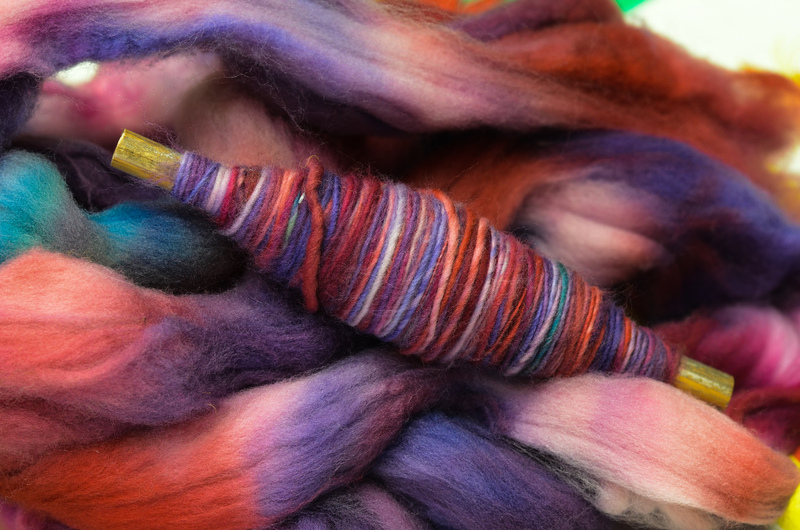 We still have space in the Felted Fashion Workshop here that starts February 2. Ask me about coming to the one-day dye workshop component, too. 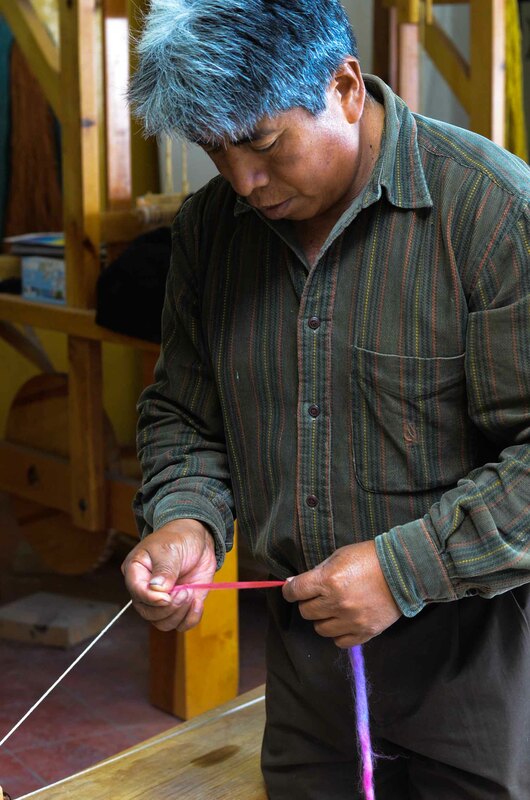 This entry was posted in Oaxaca Mexico art and culture, Teotitlan del Valle, Textiles, Tapestries & Weaving, Workshops and Retreats and tagged fiber, knitting, Mexico, Oaxaca, textiles, weaving, wool. Bookmark the permalink. What is the local wool like that Federico and other local artists use? Rugs would require something heavier, I imagine, but is there enough variety that the felting workshop could include a visit to the shepherd? Hi, Stephen! 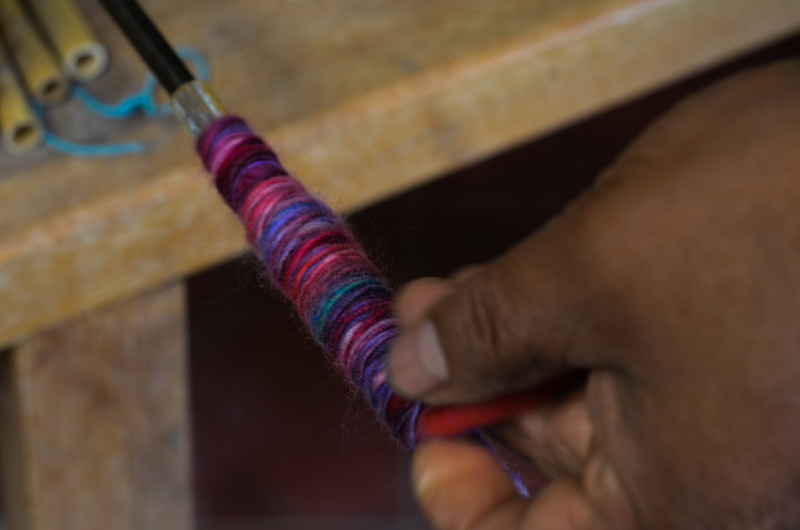 The local wool comes from the churro sheep and you are right, it is very sturdy, dense and perfect for the type of weaving in the village of Teotitlan del Valle — strong enough for floor rugs, carpets, and wall hangings. 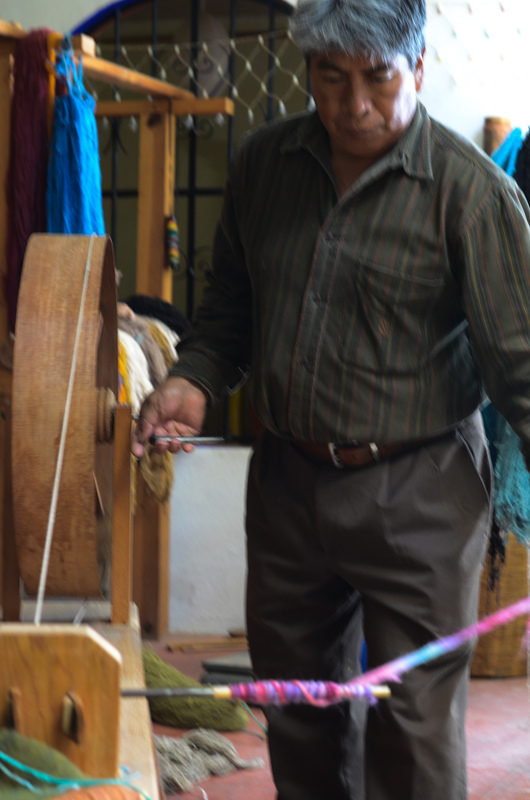 We will be visiting various weavers including Federico Chavez Sosa during the felting workshop. It is in the itinerary! Thanks so much for your question and comments. Beautiful wool. If his head is 23 inches, why did you need more than 69 stitches? Just for extra room? He will be pleased with the finished product. You are correct, Elaine. I made a typo and then corrected the measurements to reflect the decreases after knitting 2″ of length. Thanks for bringing this to my attention. I’ve made the correction in the pattern!